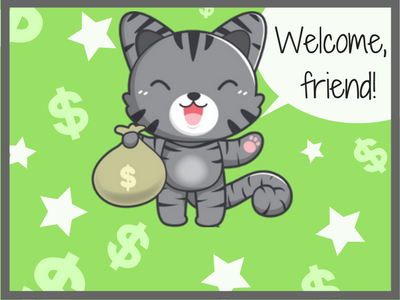 Welcome to Money with Meow! Hello! I'm Meow, a personal finance enthusiast living in New York. In my previous life, I was a free spirited artist, and up until my early 20s, I thought I was "bad with money". Any talk of budgeting, IRAs, or taxes made me my mind snap closed like a clam. I didn't just think I was bad at it: I thought that I was innately incapable of understanding it, like there was some genetic trait that made you "artsy" and therefore incapable of dealing with money and numbers. Boy, was I lied to. When I was 25, all of that changed. I went back to school to take some classes in accounting, simply because I wanted to pick the scariest thing and master it. I learned a lot about myself and the world, and moved to New York to work as a bookkeeper. Now, I want to share this empowered feeling with others by teaching people about money using simple terms that anyone can understand. I've noticed a lot of personal finance articles floating around on social media, but they are sponsored by people trying to sell you something, so it's hard to know when to trust their advice. There are lots of providers that I fangirl over (like Vanguard and Fidelity), but nobody's paying me to hawk them. I have some ads up on the site, which I can't say if I recommend or not because I think they are based on your search history, and I have an Amazon affiliate account, so I get a couple pennies if you buy a book or whatever off Amazon. When I recommend things, it's because I think they're really great, and I promise to always tell you if someone's sponsoring me to write something. That's just called "not being a skeezeball". Anyways, I believe in the basics: spending less than you make, saving for a rainy day, and letting your money make money. I'm solidly a millennial, I graduated art school in 2009 in Cleveland of all places, so I know we have it harder than our parents' generation. There's a lot of material out there for reading, so don't take me as the grand authority: stay curious and think critically about everything you read before settling down on ideas of your own. If it's your first time here and you want to know where to start, I suggest starting out with "Personal Finance Basics". Feel free to talk to me in the comments, too. I'm not a financial advisor, and I'm certainly not YOUR advisor. Everything I talk about is my own opinions, just general chatter only, so please check the source, check my math, do your own due diligence, and so on. I suggest getting a second opinion, maybe even a third, before making a big decision.